The idiots at Fruit of the Loom have decided to make our life more difficult. 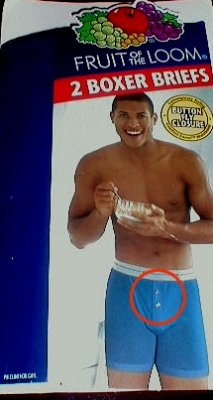 If you look closely at the picture on the left (circled in red) you can see their new innovation in underwear. I guess this goes along with Levi's innovation of button fly jeans. As I indicated in my letter to Fruit of the Loom, I would be pissed if I could get it out of my pants.